Morgan James Publishing, 9781630477653, 256pp. Historically, men and women have worked to provide the bare essentials for everyday life. 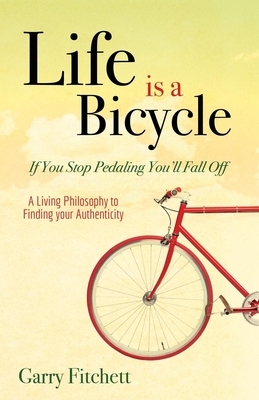 "Life is a Bicycle If You Stop Pedaling You ll Fall Off" explores work's next generation of thought and examines its higher purpose: to nurture the advancing mind and unfold the soul. It is your birthright to express yourself harmoniously through your daily work. The bicycle as a metaphor for life endeavors to clothe the ideal of finding one's professional true north in a recognizable and practical form. It makes the act of discovering one's genuine work physical, understandable, and ultimately, actionable. If you believe your talent, energy, and appetite indicate ideal work that is capable of bringing out your best while reaping the greatest professional enjoyment possible and this is the life you want then you must answer the question: Who's riding my bicycle? After graduating from the University of North Carolina at Chapel Hill with a master's degree in education, Garry Fitchett abruptly chose not to enter the teaching profession. Instead he followed his heart and became a business executive and eventually co-owned a business development company. Despite his business success, he longed to find deeply meaningful work that would allow him to display his authentic self. In the spring of 2012, he sold his business and embarked on a three-year intellectual journey to answer the riddle of how one goes about finding his or her authentic work. Life is a Bicycle: If You Stop Pedaling You'll Fall Off is the culmination of that philosophic journey, revealing the efforts of his research and self-reflection.